Lightbridge Academy is committed to supporting the ever evolving needs of the busy working family. Our business model successfully balances high-quality early education, family-focused customer service with a culture of care. We are growing rapidly, opening new markets and opportunities for savvy franchisees who share our core beliefs and have the heart for the care and education of children and a deep concern for serving the needs of the families that love them. Click on the map to see current locations and opportunities. 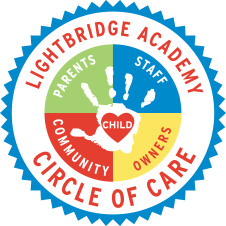 Lightbridge Academy offers a unique Circle of Care, in which the needs of parents are as important as the care and education of their children. Lightbridge Academy serves children from six weeks of age through Kindergarten. first filed according to state law and which complies with the FTC rule.